Yes, those are all chicken feathers — 40,000 pounds of feathers. A semi-truck lost them when it rolled over Wednesday on Interstate 5 in Washington state. Here, have another picture of the feathers. Not every story has to make for hard-hitting journalism. Sometimes, a Wednesday evening just calls for a fluff piece — and sometimes, we mean "fluff piece" literally. Commuters in Washington state found themselves stuck in a massive traffic jam before dawn Wednesday after a semi-truck rolled over on Interstate 5, spilling some rather curious cargo onto the asphalt: feathers. Lots and lots — and lots — of feathers. 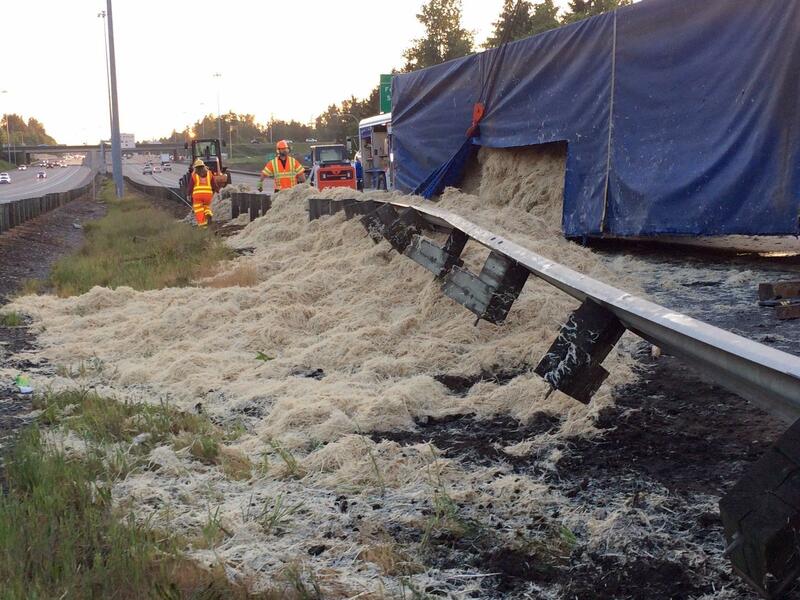 In fact, the Washington State Department of Transportation said the overturned semi lost about 40,000 pounds of chicken feathers. A WSDOT traffic engineer did some helpful calculations for all of us, noting the load roughly equates to 18 million feathers — or, by another measure, "almost 2,300 chickens worth of feathers." Then, the department dropped a GIF that had a rather suspicious amount of personality for a government social media account. The weird collision got a hashtag of its own too, of course: #featherfiasco. Washington State Patrol reassures us that only the semi was involved in the collision and that the driver was not injured either, according to The Seattle Times. The service's public information officer, Rick Johnson, told the newspaper that the driver admitted he had fallen asleep at the wheel. 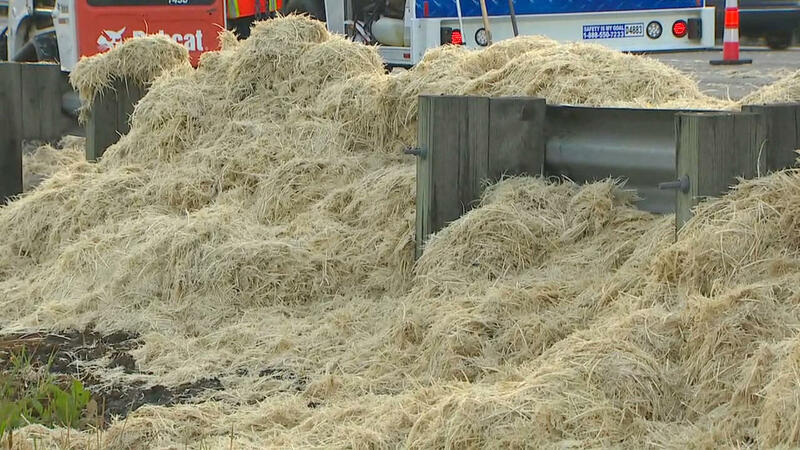 The truck had been taking the feathers "from a poultry facility to a rendering company in Vancouver, British Columbia," The Associated Press reports, noting that the company "recycles animal byproducts into ingredients for items including pet feed and soap." Chicken feathers, an often unwanted byproduct of the poultry industry, are packed with a strong protein known as keratin that can also be molded into biodegradable plastics. Modern Farmer notes they've been used in everything from dishes and furniture to shoe soles and wall insulation. Useful they may be — but goodness knows they can be tough to pick up. So tough, in fact, that authorities had to break out some construction equipment to scoop them off the surface. It took a few hours before the messy situation was finally cleaned up. But vestiges of the feathers would linger a little longer still. The feathers "definitely have an odor," Johnson told The Seattle Times. "I asked (colleagues) to tell me the truth about whether I smell like chicken."